Mine is a predictable blog world. Daily views hover within expected constants. Every few weeks views spike sharply, an anomaly driven by a random viewer browsing hundreds of posts in one go. Followers, views and statistical analysis mean nothing, but search term directed traffic is fascinating. Specifically – why “core 7” generates more traffic than all other search terms combined. This afternoon blog views went crazy, hourly visits grew in hundreds rather than familiar dozens. “Hey, cool” I remarked to my husband, “looks like someone is blitzing my blog again”, then promptly forgot about it until a few hours ago. Usually rogue view spikes subside within a few hours, this one was anything but normal. For the first time in Notes history a investigation took shape. I don’t know what it takes to appear on the first page of a Google search, but there I am courtesy Reddit and my top traffic generating search term. Go figure. Gavrinis and Core No. 7 have more in common than 4,000 BC archeological mysteries – after five years and over 1,300 posts, Core No. 7 and Gavrinis rank first and second in search terms generating Notes traffic. Core No. 7 – In 1881 British archeologist Flinders Petrie picked up a smooth rock near the pyramids at Giza, a seemingly impossible plug of granite construction debris. Science doesn’t know how, but think they know where No. 7 came from. A plug of red granite drilled to form a door pivot – not chiseled, drilled with precision accuracy. Drills leave markings behind – a road map of rate and pressure. This is when 4000 year old granite cores get freaky – the markings on Core No. 7 are so perfectly spaced, engineers don’t believe a modern diamond tip mechanized drill could duplicate them. 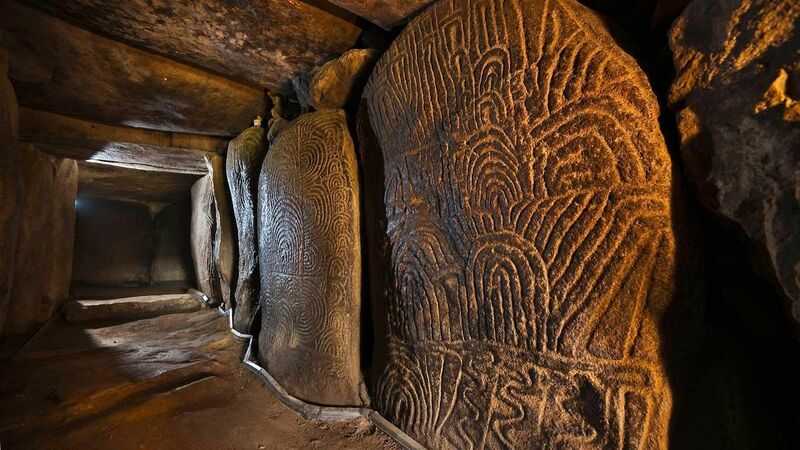 Gavrinis – Worlds away from mysteries of Egypt, a tiny rock off the coast of Brittany in France harbours the wonder of Gavrinis.In 1835 French archeologists poked about a sunken burial chamber entrance on uninhabited Gavrinis, full excavation took place in the 1930s. Waiting inside, over 50 stone slabs, more than half adorned with intricate carvings resembling fingerprints. Mathematicians believe it a code of sorts. Computer analysis dropped a bombshell – patterns represent the number of days in a year, references to solstice and equinoxes, an exact longitude and latitude of the island, and the “mathematical constant Pi”. When I “publish” tonight, Notes celebrates 1,000 ponders. Agonizing all day over how that feels, what I’ve learned, how I’ve grown and people I’ve met, struck me as cheesy. Then it hit me – 1,000 doesn’t want a parade, 1,000 feels like pondering Lego videos.